Tomato season is upon us! By the time my tomatoes are ripening, my basil plants are out of control, begging to be cut back so they can continue growing even more out of control. What better way to use tomatoes and basil together than in a fresh bruschetta? 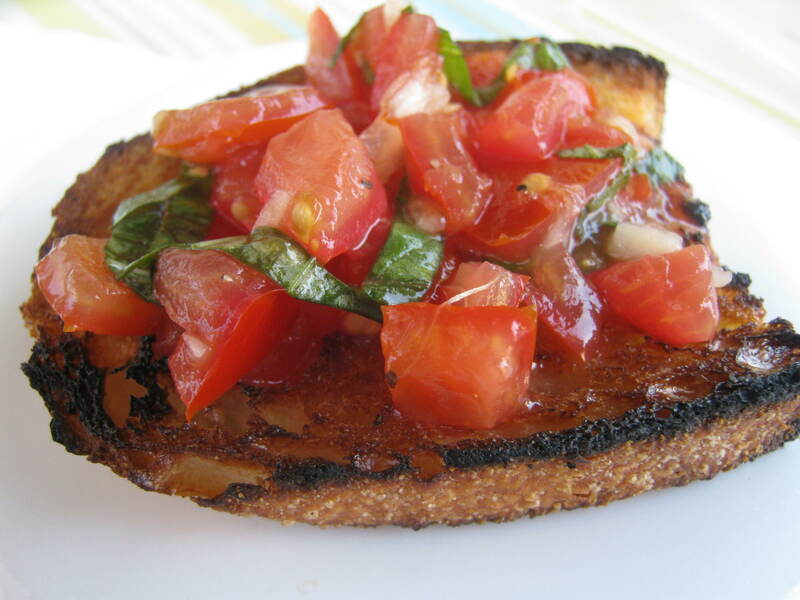 I first made bruschetta after taking an Italian cooking class, and it was one of my first successes in the kitchen. For years, I followed that recipe to a tee, using only Roma tomatoes and measuring each ingredient oh-so-carefully so as not to alter a thing. Well, that approach has changed, and now I use whatever tomatoes I have, and rarely measure anything. I have refined my recipe over the years and even incorporate a tomato-grating technique I picked up from my favorite Spanish chef, José Andrés. No more chunks of tomato falling off the bread en route to my mouth! I love bruschetta prepared this way, and even my meat-and-potatoes-loving husband has asked, “Can’t we just have the bruschetta for dinner?” So without further ado, here’s my twist on this classic Italian favorite. Take a round tomato and cut across its equator. Grate both halves on a cheese grater until just the skin remains. 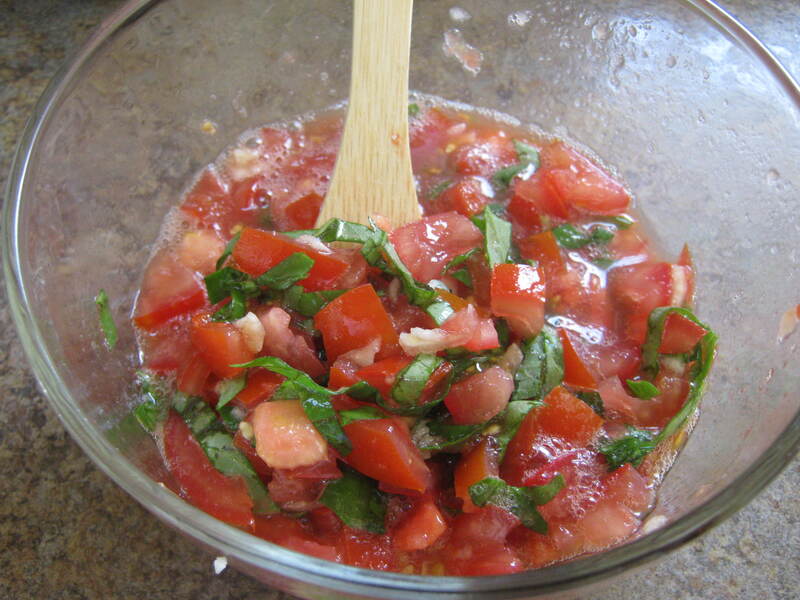 Discard the skin and place the grated tomatoes in a medium bowl (a glass bowl is best). 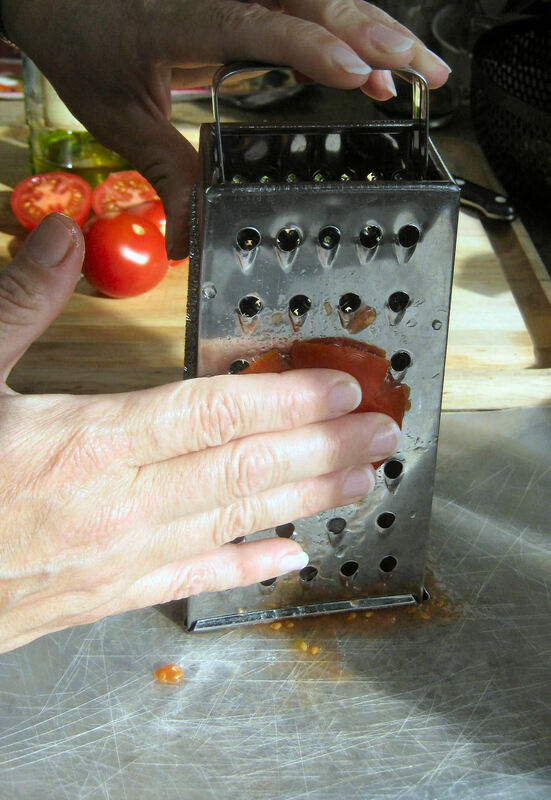 Depending on the consistency desired, grate one or two more tomatoes. Slice each remaining tomato across the equator, then squeeze and discard the seeds and juice from each one. Dice them and add them to the bowl with the grated tomato. 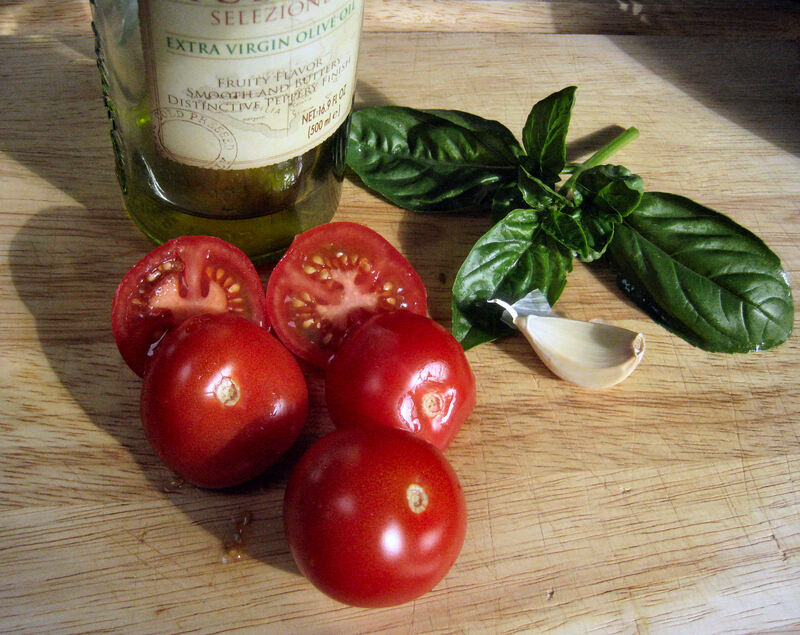 Add the minced garlic, basil, olive oil, and just a little salt and pepper. Mix well, cover and let sit at room temperature at least 30 minutes or up to 3-4 hours. Prior to serving, taste the mixture. If it needs a little extra acidity, add a little red wine vinegar. Add salt and pepper to taste just before serving. Slice the bread/baguette into individual serving sizes. Brush both sides of the bread slices with a good quality extra virgin olive oil. To grill the bread, place the bread slices on a hot grill and toast each side until slightly golden – don’t let them burn. To toast the bread in an oven: place the bread slices on a baking sheet and broil each side for 2-3 minutes or until slightly golden in color. Again, watch that they don’t burn. Note: In a pinch, you can toast the bread in a standard toaster or toaster oven, but it will take longer to toast several pieces. Allow the bread to cool, and plate it alongside the tomato mixture. Allow guests to spoon the tomato mixture on the bread right at the table: topping the bread too early will result in soggy bread. For years, I made this dish using diced Roma tomatoes, as they are supposed to be firmer and best suited for this recipe. However, I was never completely happy with the flavor (the flavors never seemed to really meld to my liking), nor the texture (the diced tomatoes merely sat atop the toasted bread, and most of them usually fell off with every bite). It wasn’t until I saw a cooking segment on TV featuring my favorite Spanish chef preparing Pan con tomate that I finally got an idea as to how I could reinvent my bruschetta. Pan con tomate, literally “bread with tomatoes,” is made by grating tomatoes instead of dicing them. 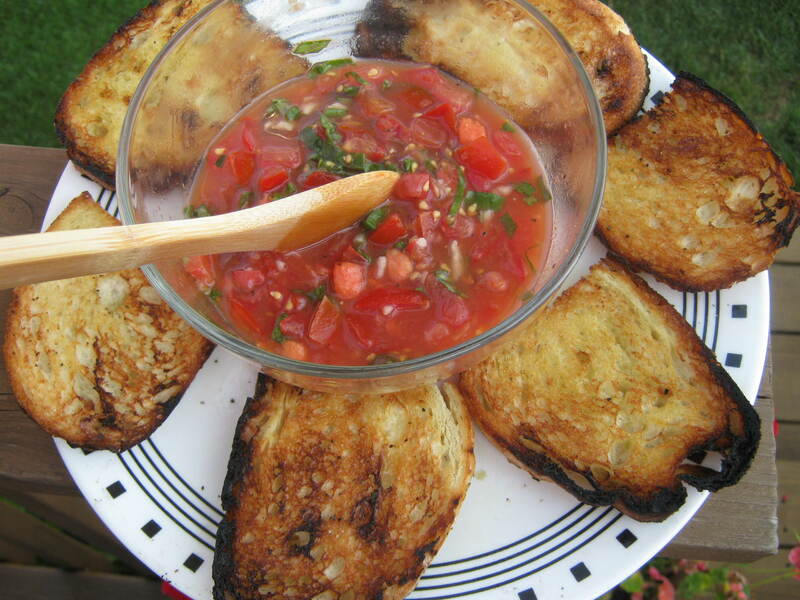 I tried this approach with my bruschetta and never looked back again: now I had a mixture that, because of the grated tomatoes and liquid, solved both of my complaints: the liquid allowed all the flavors to really meld (and also to soak into the bread for better texture and flavor), and the toppings finally stayed on the bread! 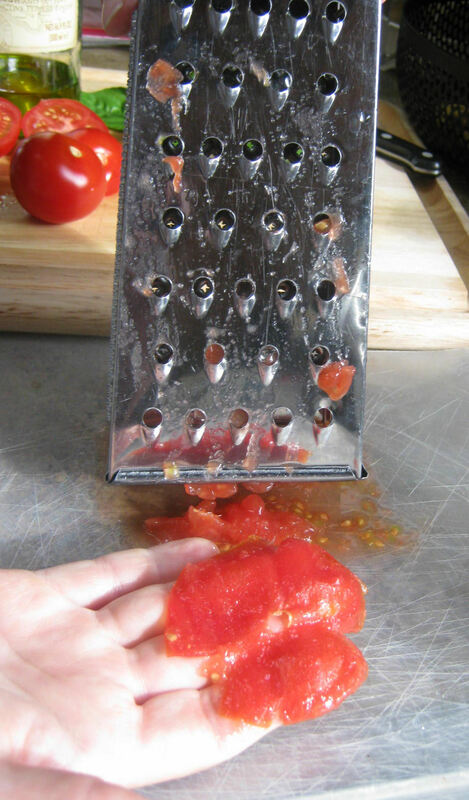 Gather your ingredients, and slice the first tomato across its equator, as shown below. Grate both halves on a cheese grater. You can either use a grater that fits right over — or even inside — the bowl, or a standing grater, as shown here. Grate carefully until just the skin remains (don’t grate your fingers!) and discard the skin. Repeat with as many tomatoes as needed for the desired consistency. 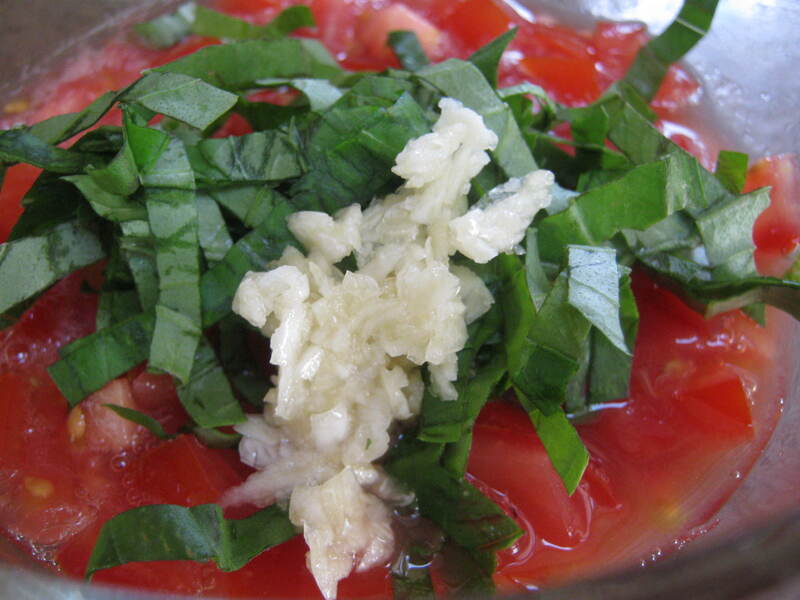 Place the grated tomatoes in a medium bowl (a glass bowl is best). Using the flexible mat for this step makes it really easy. It all just slides right into the bowl. Slice the remaining tomatoes across the equator, then squeeze and discard the seeds and juice from each one. Dice them and add them to the bowl, then stir in the garlic and basil. Drizzle in about 3 T of extra virgin olive oil. You don’t want it too oily, but it will add a great flavor (and lots of health benefits). Add just a little salt and pepper and mix well. Cover with plastic wrap and let rest at room temperature for at least 30 minutes or even up to several hours. The longer it sits, the more the flavors fuse. Prior to serving, taste the mixture. If it needs a little extra acidity, add a little red wine vinegar. Add salt and pepper to taste just before serving. To prepare the bread, slice the bread/baguette into individual serving sizes. Brush both sides of the bread slices with a good quality extra virgin olive oil. I love this silicon pastry brush from IKEA for this step. Toast the bread, either on a grill or under the broiler in the oven. In a pinch, you can toast it in a standard toaster (or toaster oven), but these methods are easier for toasting several pieces at once, and add a little more flavor, too. On a grill: place the bread slices on a hot grill and toast each side until slightly golden – don’t let them burn. Again, about 2-3 minutes each side should be enough, but keep a close eye on them. Let the toasted bread cool, and plate alongside the tomato mixture. 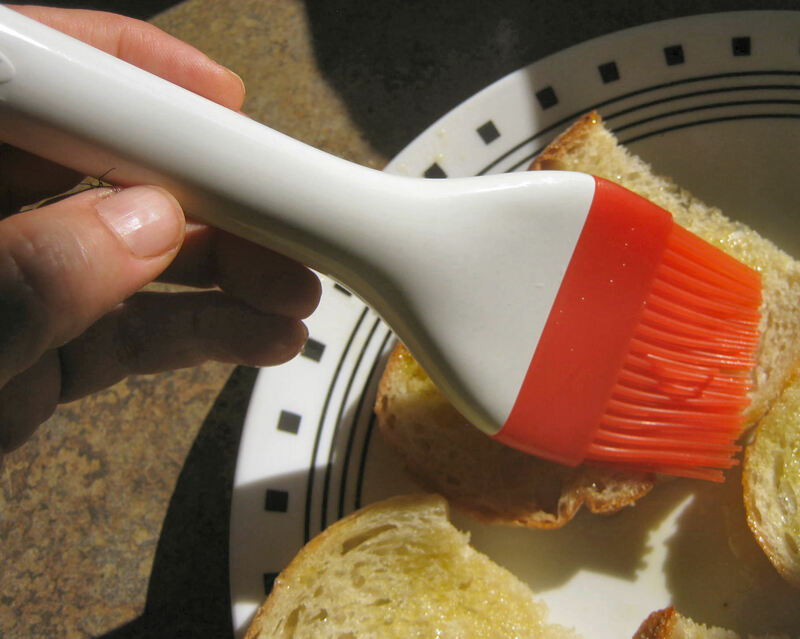 Allow guests to spoon the tomato mixture on the bread right at the table: topping the bread too early will result in soggy bread. Enjoy! Note: this recipe can be doubled, tripled, etc. based on how many tomatoes you have. Or how hungry you are.